I usually make a point of having the windows open at least 1/2 hr a day (winter included) to renew the air at home, especially since Octave and I both work from the same home office. Also, as you may know, Oregon has been plagued with wildfires, the air quality levels here in Portland hit a pretty low level a couple weeks ago, meaning that, for health reasons (it was literally raining ash), we had to keep the windows shut for a couple days. I got a little insane, as we have no A/C and the temperatures were still summery, and looked for ways to make our environment better. I used the tiny air humidifier Octave gave me as a present a year ago. I would turn on the floor fan from time to time to make the hot air generated by both our computers circulate. And then, I turned to scents. I made a scented spray - Water + 10 drops of essentiels oils in a sprayer. I brought water to a boil after adding a couple drops of essential oils. I burnt some palo santo. I like to make a ritual out of it after each cleaning session or right before guests arrive. 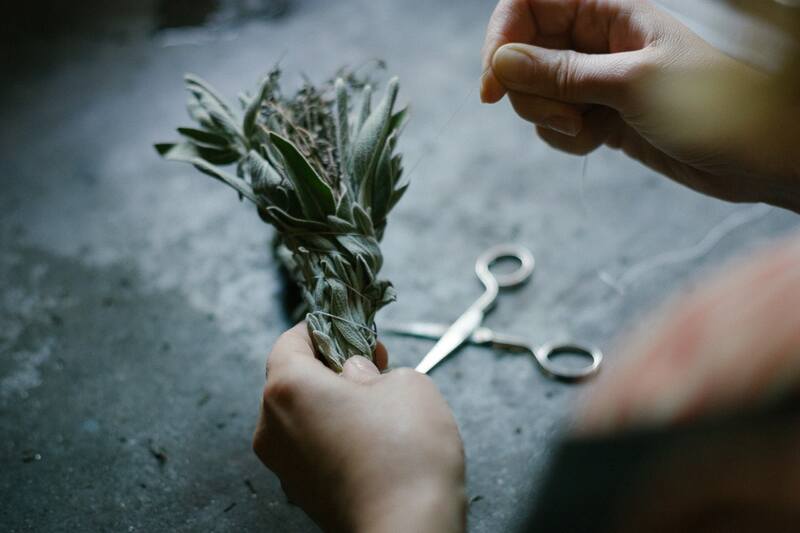 But last week, our friends at Tendue gave us A LOT of sage. Octave used some to cook and I decided to finally try to make smudge wands as these can sometimes be pretty pricy. 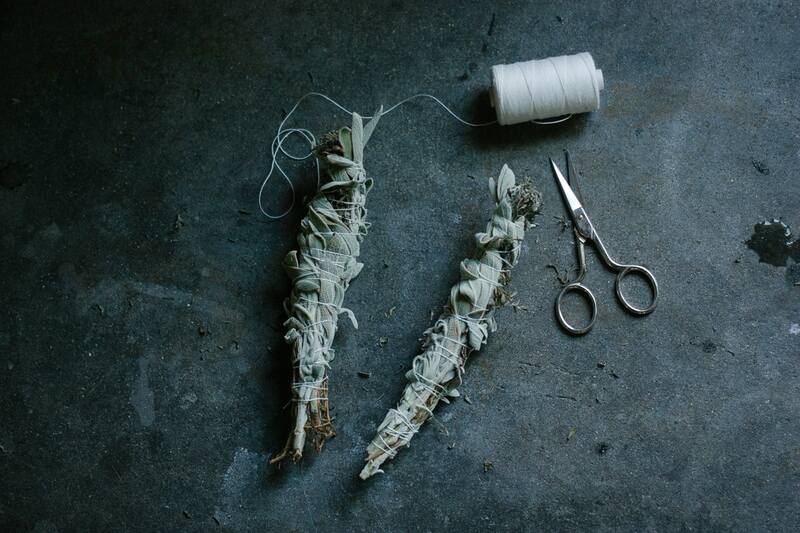 Smudge wands are the perfect way to make your house feel homey and fresh. 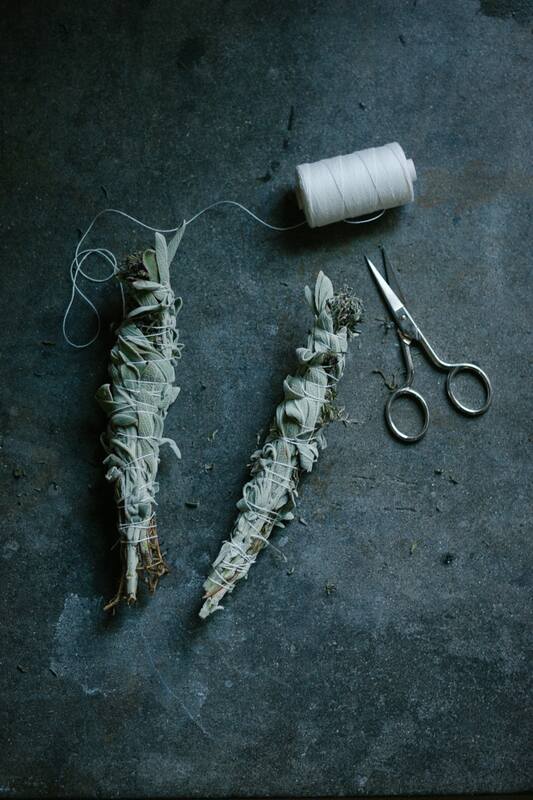 Make a ritual by burning them for a specific event, or for no reason at all. Really, it's up to you! 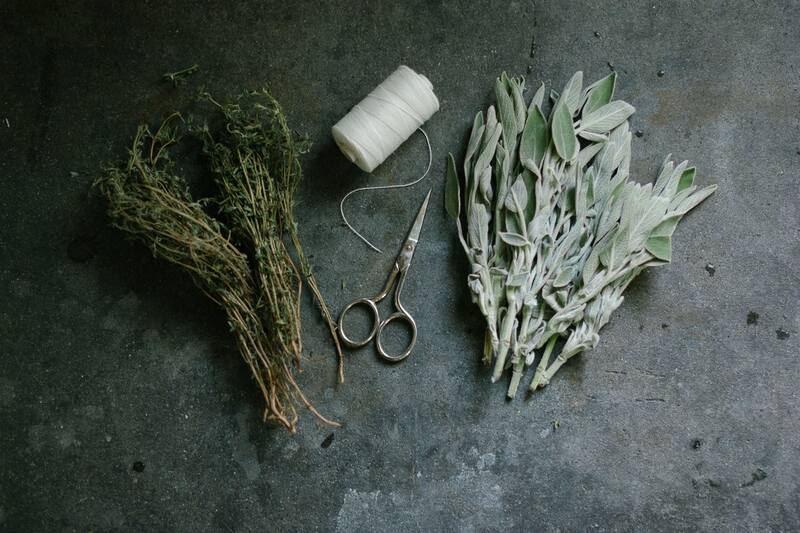 Separate the sage and rosemary into tiny bundles. Tie a knot at the base with your thread. 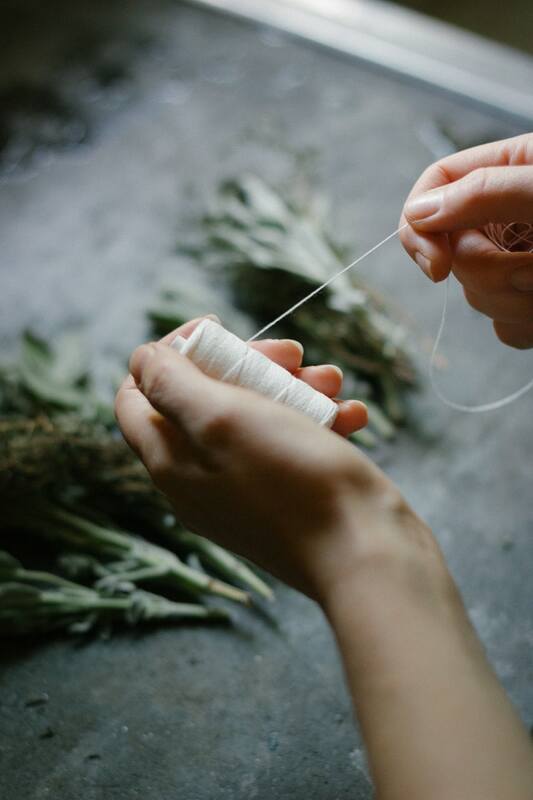 Roll the thread tightly up and down the bundle. Hang upside down in a cool dark space until it is completely dried out (2-3 weeks). Light your wand until it begins to smoke. Blow on it if a flame appears. Wave the smoke around your house. You might need to light your wand a couple times during the ritual. 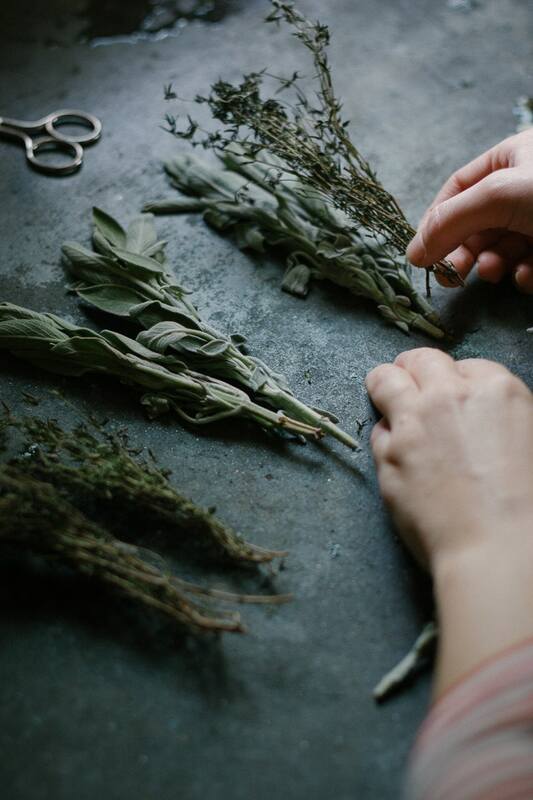 Great times to have a sage smudging ritual include: when moving into a new place, before guests arrive, after an illness, before meditating. You can add various scents to your bundle. Some people like to add rose petals, or even tiny rose buds. The options are endless. What are your secrets and rituals for a fresh smelling home?